According to people with knowledge of the situation, Amazon is planning to bring out their own smartphone to compete with Apple’s iPhone line. A Bloomberg revelation provided that information recently. The idea of a Kindle phone is something that has been touched on here before, particularly during the days leading up to the formal announcement of the Kindle Fire when anything seemed possible. It is increasingly likely that this is going to be the next stage of Kindle growth now that a tablet presence has been established. The Kindle Fire gives the retail giant a foothold in portable electronics in a way that even the Kindle eReader couldn’t accomplish. The Kindle built its own market and basically kicked off the previously minimal eBook industry. The Kindle Fire proved that Amazon was both willing and able to enter into an existing device market and hold their own. In addition to building up consumer trust, it helps get things ready to enter into an even more competitive market. Selling a smartphone is not likely to be a simple task, even for Amazon. This is not a company known for passing any large amount of control to their partners. While it is standard practice for carriers to demand custom devices, it is hard to imagine a Kindle phone going that way. The whole point of Amazon’s hardware development is to lock people into a fairly closed loop of media services provided by Amazon and nobody else. Allowing carrier customization would seem likely to dilute their own branding somewhat. This move would also open the company up to any number of patent disputes. It doesn’t matter whether they manage to acquire a large patent portfolio to defend against infringements, though sources indicate that this is exactly what is happening already, lawsuits over mobile devices are the norm rather than the exception right now. On the plus side, the fact that Amazon already has a well-received fork of the popular Android OS will help them get off the ground. Despite running on Google’s software, the experience provided by the Kindle Fire is sufficiently unique to make it stand out. A similar effort released in a smartphone would provide an attractive alternative to the competition. It would also greatly expand the potential user base for Amazon’s Appstore for Android, which many users find preferable to Google Play’s less carefully policed app store already. More users would naturally add additional pressure for app developers who might be on the fence about signing up with Amazon so far. Since we have no more solid information aside from comments by “people who should know”, this can’t be taken too seriously. It would definitely be a smart move in some ways, but the added expenses from carriers, legal defenses, and assorted other problems particular to the mobile communications industry would make it difficult for Amazon to continue maintaining their policy of providing ridiculously low prices on all their hardware. 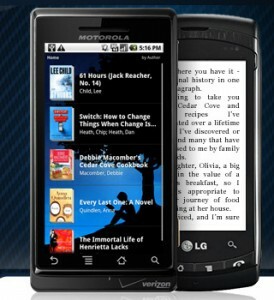 Would a Kindle phone sell well? Probably. Would it sell well enough for it to be worth the investment? It’s too early to tell, though Amazon seems to be considering the possibility. This entry was posted in Amazon, Kindle News, Kindle Rumours and tagged Bloomberg, Kindle Fire, kindle phone, kindle vs android, rumor by matthew. Bookmark the permalink.